A 8 month baby with seizures. Birth history is significant, discharge summary mentions pre term cesarean section delivery for meconium staining. MRI Brain shows a faint low signal intensity focal hemosiderin staining on GRE in right parietal peri ventricular white matter is a resolved Germinal Matrix Bleed consistent with history of pre maturity and a possible Birth Asphyxia. Rest of the MRI Brain is within normal limits. The germinal matrix is a layer of cells near the Csf containing ventricles of the brain, formed early during embryogenesis and is the site of glial and neuronal differentiation. Activity in the germinal matrix peaks between 8 and 28 weeks during embryonic development. From here cells migrate peripherally to form the brain. It is densely cellular and vascular. The blood vessels of the germinal matrix are weak walled and predisposed to hemorrhage. By 35-36 weeks gestation the germinal matrix essentially disappears and thus the risk of hemorrhage is markedly reduced. The brain of a premature infant lacks the ability to autoregulate cerebral blood pressure; thus, fluctuations in cerebral blood pressure and flow can rupture the primitive germinal matrix vessels or lead to infarction of the metabolically active germinal matrix. It may occur before birth, or within several hours following birth. A hemorrhage can extend into the periventricular white matter, resulting in significant neurologic sequelae like cerebral palsy, mental retardation, and seizures. Blood may rupture the ventricles, increasing the damage to the brain. 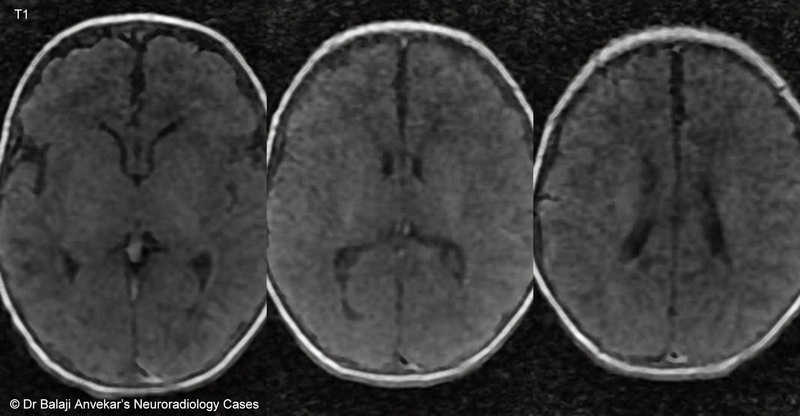 On CT and MRI of brain of infant, the appearance of the hemorrhage will vary according to the age of the bleed and time of scanning. With time bleed resolves, follow up CT and MRI may show post haemorrhagic hydrocephalus secondary to blockage of villi, periventricular leukomalacia, cavitations as subependymal cyst or Porencephalic cyst with or without hemosiderin staining. MRI GRE sequence is sensitive for hemosiderin, a blood degradation product. Prevention of premature delivery is ideal. Antenatal dexamethasone administered to the mother, or indomethacin administered to the infant also decrease the incidence, although the exact mechanism by which this occurs is uncertain . If hydrocephalus is present, CSF drainage may be necessary.Prognosis depends on the extent of haemorrhage and presence of hydrocephalus. I am Tarun, a radiologist of Indian origin in Australia. Just would like to tell you about the excellent blog you have. Really informative and lots of cases. You must be doing a lot of MRIs. Pity that you don't have access to 3T, surely with all the work you are doing and excellent diagnostic ability, you can use one.